Read on to See All of the Exciting News About NMPL! Many of you probably feel as though a Library renovation has been in the planning stages forever and you would be right if 20 years is forever. Five directors ago, in 1998 at the 100th anniversary of the library, it was announced that the Library was going to renovate. It had been more than 20 years since the last renovation. Then, the need for the new high school was evident and the Library chose to wait because the school was more important. Plans were presented in 2008, but 2008 was 2008, need we say more? Now, we have a gorgeous design that stays on our footprint, provides what the town needs in terms of meeting space, study rooms, children’s and teen space, and we need you to come and support it. 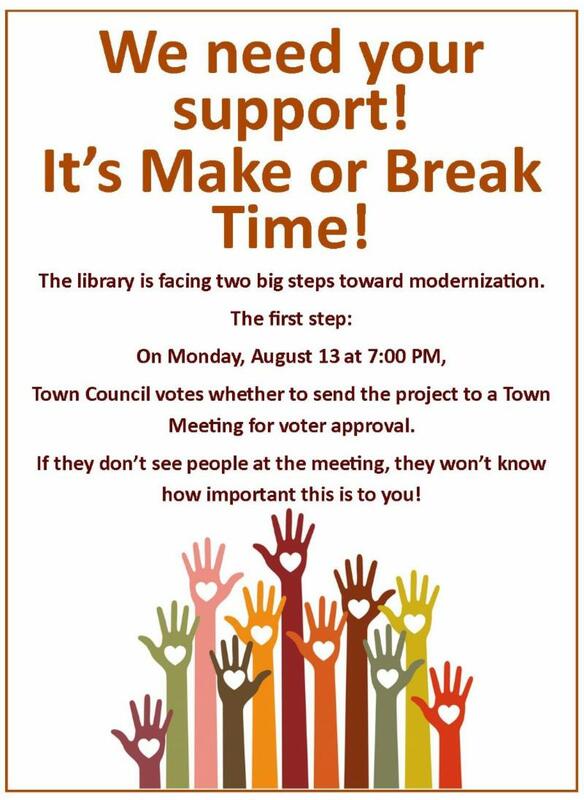 The Town Council will vote on August 13th at 7:00 PM in the E. Paul Martin Room at Town Hall whether to send the Library project to a Town Meeting for a town-wide vote. We need the Town Council to see how important this is to people, so we need you there. 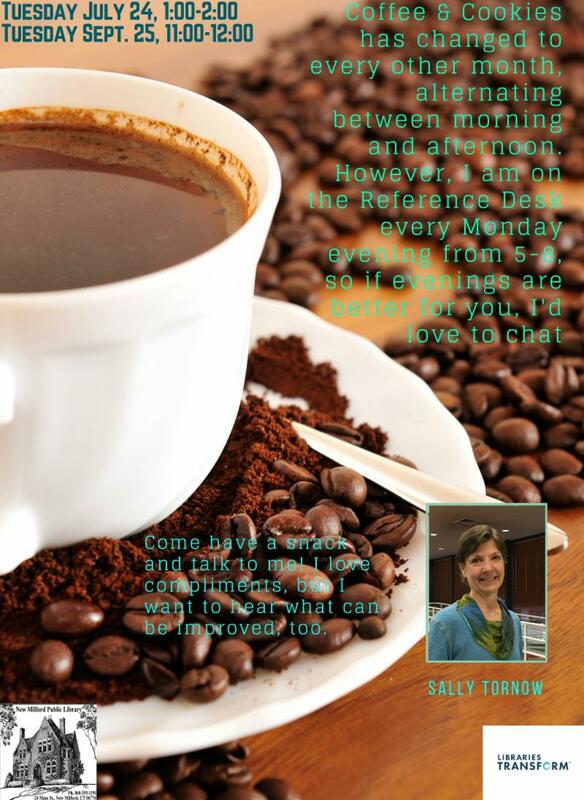 If you can’t attend please send an email to towncouncil@newmilford.org expressing your support. Every public library in CT but one has been renovated more recently than our last renovation 41 years ago in 1977. Don’t you deserve a modern library? We have highlighted our in-house resource The Foundation Directory Online several times in our newsletter. As you know, it is the ultimate source of information on funding sources for nonprofits and it has the most comprehensive database on grant makers and their grants. 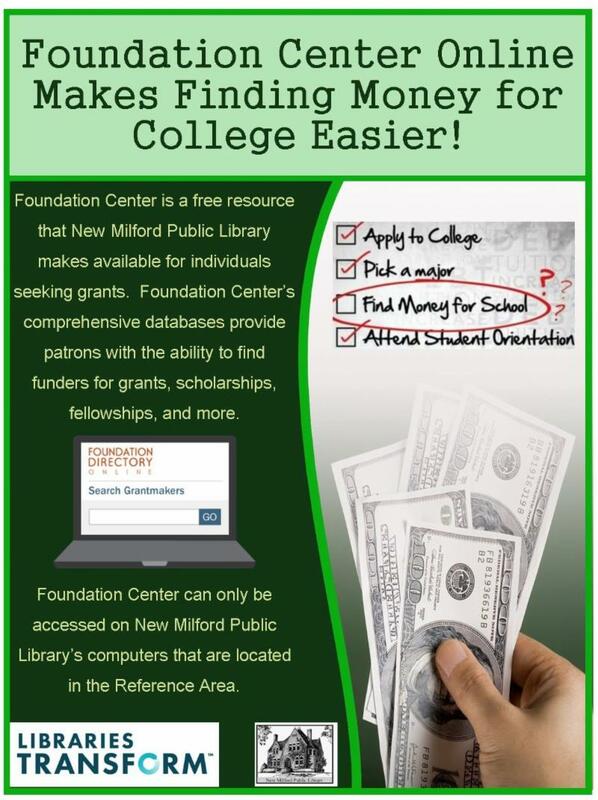 However, did you know it also provides you with ability to find money for college?? The grants, scholarships, fellowships that you may find make this a wonderful resource for parents and students!! For more information or assistance please contact our Digital Literacy Associate, Rachael at 860-355-1191 x213. The Great American Read continues! Don’t forget to vote (if you have not already – the list) and we have a free weekly raffle to win one of the 100 titles between July 1st and October 8th – simply read three of the titles to obtain a raffle ticket. We are also hosting a writing contest, open to anyone over the age of 16. During July and August, write a short story or poem, submit it by September 1st and you might win a 4th seat on a panel discussion comprised of three local authors that we will hold on October 3rd to discuss the theme of ‘Who Am I?’ that runs through so much of our favorite literature. The panel discussion will take place at 6:30 PM and will be comprised of local authors Nan Rossiter, Abby Ripley, and Chandra Prasad. On Wednesday, September 26th, we are proud to welcome Martha Kelly, author of Lilac Girls, to speak on one of the other themes. The library will host an end of program party on October 23rd, revealing the best-loved book of New Milford patrons, to be followed by the screening of the final PBS program live at 8:00 PM. Come in and pick up a brochure that gives details of all of the events or like us on Facebook. Or give us a call at 860-355-1191, x2. And don’t forget to vote for your favorite! Find out more details on our website at The Great American Read. Wow, Do You Love Your Library! Everyone who follows us on Facebook already knows this, but you might not have noticed how it ballooned. 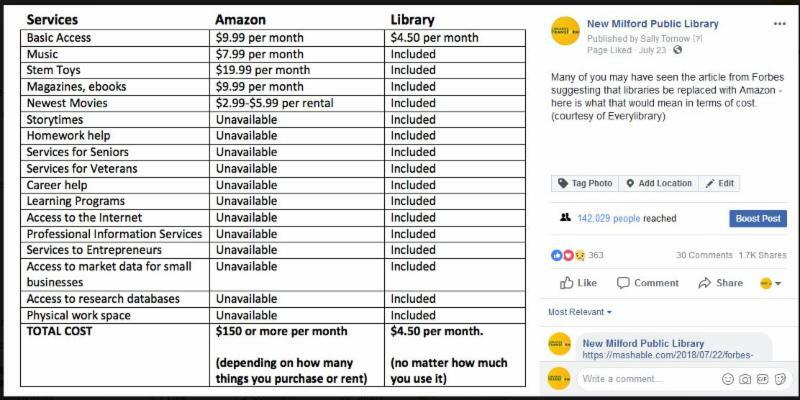 Forbes Magazine published an opinion piece by a regular contributor, Panos Mourdoukoutas, that expressed the view that Amazon could replace public libraries and save taxpayers money. Obviously not a person who actually uses a library! The article provoked a huge storm on Twitter and Facebook, and we joined the fray by publishing the following post. We knew you would respond loudly, but it never occurred to us that you would be THAT upset! As of 7/31, you can see that you had shared it 1.7 thousand times with 142,029 friends and the comments are still coming. For those of you not on our Facebook page, a normal reaction to one of our posts is around 5 shares with maybe 600 people. Everylibrary.org is an advocacy group for libraries and developed the chart as an average of what libraries in general offer and what it costs the average taxpayer. In New Milford, if your total tax bill is $3000/year, what you pay for the library is under $30/year, just about the full price of one hardcover book, and only about $2.49 per month. Oh, and Forbes pulled the article because they decided the author didn’t know what he was talking about. JobNow – What Can It Do for Me? 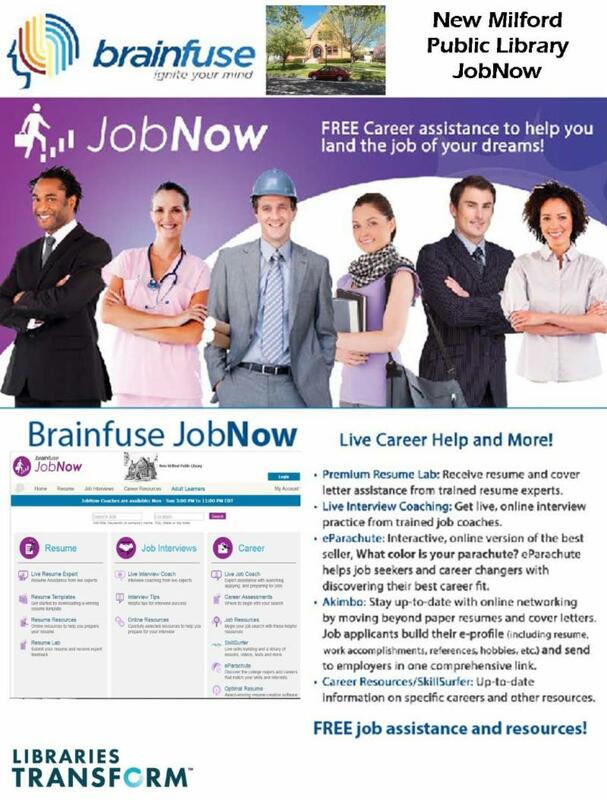 JobNow is a powerful set of tools to help you in your job search. It provides live interactive online help combined with online resources to guide you through the necessary tasks to get a job. The primary sections are: Ace the Interview, Resume Builder and Career Resources. Each of these sections features an opportunity for live one-on-one interaction with certified Job Coaches who will answer questions, make suggestions and guide you through all the steps of your career search. Plus you have access to a wide variety of highly recommended online resources including personality and career assessments. Check it out! Check here often to see how our Library Modernization Project is progressing! Check out our new Calendar Feed option! Go to Burbio.